Pioneers in the industry, we offer aluminium mirror finish deluxe kadai round bottom, aluminium mirror finish chinese kadai round bottom, aluminium mirror finish deep kadai flat bottom, aluminium mirror finish taiwan kadai, aluminium mirror finish mini kadai cute wh and aluminium mirror finish deep kadai flat bottom (woh) from India. Supported by the team of diligent professionals, our firm is offering an assortment of Deluxe Kadai Round Bottom. 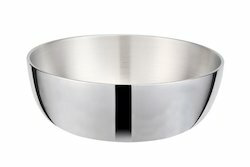 Made using pure virgin aluminum; the given product is available in both induction and non-induction base and is demanded for its high strength and flawless finish. Further, this can be availed at reasonable rates. To meet divergent demands of the clients; we bring forth an extensive assortment of Chinese Kadai Round Bottom. Demanded due to its appealing design and flawless finish; the given product is fabricated using superior grade material which makes it high durable. Moreover, this can be availed at nominal rates. Catering to the diverse demands of our clients, our organization is offering a quality range of Deep Kadai Flat Bottom. The given product is fuel efficient and offers uniform heating. It is available in elegant design and is demanded due to its superior finish, excellent grip, and easy usage. Further, clients can get it at reasonable rates. *Made from pure vergin ALUMINIUM. 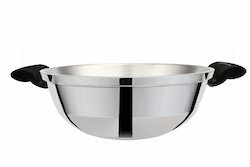 Looking for “Macclite ISI Aluminium Mirror Finish Kadai”?